Almost 4 years ago we made the choice to downsize our home. Our family of 5 moved into a house that was nearly 2,000 square feet smaller than the one we were currently living in. There were many reasons for our family to downsize our home. If you have been wondering, “should I downsize my home?” Well, I’ve got the answer. Here are the 12 most common signs that you should downsize your home. *This post contains affiliate links. Although I may make a commission, all recommendations are my own. What does downsizing my home mean? Downsizing your home can mean so many things. For our family it meant downsizing our home by around 2,000 square feet. If you have a second home or a cabin, it could mean putting that on the market. You can also downsize your life by simply clearing away some of the clutter that has taken over. If you have multiple vehicles, downsizing might mean making the transition to a one car family. Whatever downsizing might mean to you and your family, here are 12 reasons why downsizing might be right for you. Let’s start with a very obvious reason to downsize: you want to downsize. If you feel that desire to downsize your home then chances are you are on to something. One lesson I have learned in life is to never ignore that inner voice nudging you in a different direction. I know it can be scary. Jumping into the unknown always is. But chances are, you only stand to benefit from it. When we moved into our “big house“, a problem I faced was that there were just so many rooms to fill. It felt overwhelming. Do you have a room in your house that doesn’t get used like you had hoped it would? Maybe it’s a formal dining room or an in-home theater area? It may be time to consider a downsize if you have spaces in your home that aren’t being used. Unused spaces may seem harmless. But take a moment to consider that you are still paying for heating, air conditioning and electricity to this area. When a big space like this that goes unused you may want to downsize your home. You may have unused spaces in your home that you had hoped would serve a greater purpose. However, you may also have areas in your home that you just have no idea what to do with. For us, this was our loft. No matter what I tried, this space just never seemed to find a purpose. It very much felt completely unnecessary. The idea of paying for shelving, seating and other decorations just to fill this space seemed so wasteful. This was a big red flag telling me I was ready to downsize my house. If you have a similar room in your home you might consider that you just don’t require that space any longer. 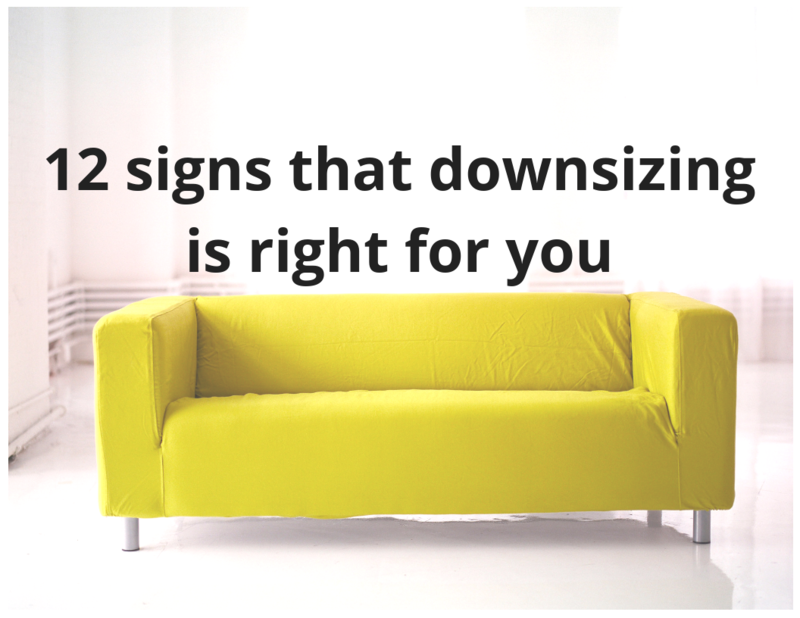 If you fit into this category, then you absolutely need to consider a downsize! Financial gurus like Dave Ramsey recommend spending less than 30% of your earnings on your living situation. That includes mortgage/rent plus utilities. To find your gross income per month, use this helpful tool on The Motley Fool that will help you determine whether or not you are living on less than 30%. In our old house, we were paying closer to 40% of our average monthly income. We are now paying less than 25%. Around a $2,000 difference each month! Because we are now earning more each month and spending less we have drastically increased the amount of financial freedom we have. If you are spending all of your waking hours working to support a lifestyle you can’t afford it’s definitely time to consider downsizing your home. Living a life bigger than one you can financially afford will only lead to disaster. The best way to determine if you are spending too much on your lifestyle is to go through the process of creating a simple budget for your family. My Fun Sized Budget Bundle is designed to do exactly that. You can create a basic budget, schedule debt payoff, plan smart shopping strategies and even save on vacation plans. See what’s in the budget bundle. Acorns: an investment app that was designed for first time investors. It’s a great way to begin hands-off investing and still build yourself a solid savings in the process. Acorns works is by rounding up your purchases and investing your spare change for you. For example, if you spend $4.50 on a cup of coffee, Acorns will round up to $5 and invest the .50 cents for you. I know that might not sound like a lot, but I promise it all adds up. See my investment plan to turn $50 into $150,000. The best part is is that you can get $5 just for signing up. Open a high-yield savings account with CIT Bank and get a 1.55% return on your investment. This is a great account for beginning savers. You only need a $100 deposit to start your account and there is a lot of flexibility when it comes to making deposits and withdrawals. Learn more about High Yield Savings. Money market account – A money market account with CIT Bank will give you a bigger return on investment at around 1.85% and again only requires $100 to open. This is a smart choice when it comes to building a solid savings because you have less options to withdrawal money which ensures that you end up saving more. Learn more about Money Market Accounts. Savings Builder – Opening a Savings Builder account is one of the smartest moves you can make when it comes to setting up a consistent, high earning savings account. You can get up t a 2.25% interest rate with CIT Bank by depositing only $100 per month into your account! See other benefits of a Savings Builder account. For me, this was another major downside of living in a large home. I despised the amount of time I spent cleaning, maintaining and primping the house. Having a larger home or multiple vehicles requires a lot of your time and finances. On top of working full-time jobs, sports, school functions and, other life commitments, this can leave very little time for rest. In America today, 40 million adults are affected by anxiety disorders. This includes: Generalized Anxiety Disorder, PTSD, OCD and Major Depressive Disorder. It might be worth considering that our lack of downtime plays a huge role in the rise of depression and anxiety in our society today. Simply put, the more space you have, the more room you have to spread out. Large homes can really drive major wedges between family members. People often move from “starter homes” because they feel an obligation to grow with their family. If you have a one bedroom apartment and are expecting baby number 3, then upgrading absolutely makes sense! Unfortunately, more often than not, people are leaving a smaller, more modest home for a larger one, even though they don’t require the extra space. Creating this gap between family members naturally can lead to serious problems. If you find that your larger home is bringing you together less and less for family dinners or you are rarely communicating with your children, it might be time to consider embracing closeness through downsizing. Just like people naturally grow their homes with their families, there will also come a time in life when you no longer have as many mouths to feed. If you have children who are growing up and moving out of the house, this is a great time to consider downsizing your home. Chances are you are not going to want to take care of as much house as you grow into your older years. This is especially true if you live in a multi-level home. As we age, it often gets harder to make it up and down stairs and a safer bet may be to live in a more modestly sized one level. Taking the time to downsize around retirement age can also mean adding money to your retirement and giving you more free time for things like travel. Like I said, having a home naturally means you have to take care of that home. If your true passions lie outdoors with things like hiking, biking, mountain climbing, beach going and everything sun and fun then a downsize may be beneficial to you. Downsizing is a great way to ensure you get to spend more time outside of your actual living quarters. Besides, if you are doing all your living outside, all you really need is a place to re-coop and grab some food. Am I right? In an article shared by Forbes, it is stated that around 70% of employees hate their jobs. This is a crying shame considering that a good portion of our lives are spent at work. Now, it’s true, we need to work in order to afford to live. We have to pay for our homes, families and life, but I am a firm believer that you can do all of that while still doing something that you have a passion for. Often times people want to leave their jobs but are too afraid to do so because of the financial security. What if they can’t make enough? What if it means giving up their current lifestyle? Consider this…the top 2 things people regret the most when they are on their deathbeds are that they wish they had been truer to themselves and they hadn’t worked so hard. Downsizing your home is a small price to pay when compared to regretting your life choices just before your time on earth is up. If you want to make the leap into a different line of work, consider a downsize. Lower your monthly payments, and remove some of that financial burden you feel. Don’t let something as insignificant as a house, car, boat or clutter stand in the way of you living the life you were meant to live. An average of 80% of people are currently in debt. Considering at the time of their death around 40% of people still have mortgage debt, it’s clear to see that debt is a major problem in our society today. If you are carrying around large debts, besides a mortgage, it might be wise to consider a strategy for debt payoff. This can help determine whether or not a downsize may benefit you financially. When people graduate from college they often do so with large amounts of debt. Without taking that into consideration they jump into large mortgage and car payments. Naturally, in doing this, they find themselves quickly in over their heads. Even if your living expenses are 30% or less, the high cost of loans can drag you into a financial situation that is difficult to survive. If this is the case, a wise choice would be to plan out a debt payoff strategy and consider a temporary downsize in order to reduce the cost of living. My top recommended strategy is the Debt Snowball by Dave Ramsey. By using this strategy our family was able to pay off $6,000 in just 6 months! If you have high interest on some of your debts, consider taking out a loan with a lower interest rate. By doing this you can end up making smaller payments and paying less on interest in the long run. See if you qualify. Before beginning a debt payoff plan, make sure you have an emergency fund of at least $1,000 saved. Sell on Amazon – Buy items on sale and sell them for more on Amazon. Get the full guide! Instacart – Get paid to shop! Set your own hours and choose how involved you want to be! Get started today! QKids – Earn $16-$20 teaching English online and if you have experience with kids, you may qualify! See if you qualify. Rover – Watch dogs or walk dogs and get paid for it! See all options! SayABC – Earn up to $21 per hour, set your own hours, and teach English online! Apply today. Uber – Become a driver with Uber. Set your own schedule. Get paid up to 5 times her day along with chances for additional incentives in your city. Get started. UberEATS – Earn extra money when you need it, day or night and deliver food instead of people! See if UberEATS is in your area. VIPKid – If you have a bachelor’s degree you can make between $17 and $22/hr by teaching English online in over 32 different countries! Apply online. While having credit card debt is similar to debt itself, there is a drastic difference that you should be aware of. When we talk about having debt, that can mean student loans which is an investment in yourself and your future. Debt can be car payments that although they should be avoided, can ultimately help a person get to their jobs and help them earn a living. Credit card debt, on the other hand, is not beneficial to you in any way. More often than not, if you have credit card debt it’s because you are living beyond your means and/or struggle with impulse control. While there is a small chance that you can get credit forgiveness, see if you qualify, it’s still a smart choice to take steps to help get yourself out of this major money sucking debt. Depending on the severity of your credit card debt, drastic measures may need to be taken like downsizing your home. In most cases, however, the downsizing may just mean taking recently purchased items and selling them in order to help pay off your credit card. Another crucial way to downsize if you have credit card debt is to cut up your credit cards! Do whatever you can to help get yourself back on track! Just like I recommend with regular debts, it might be worth considering taking out a loan to consolidate your credit card debt and lower your interest rate. Apply online. I get that downsizing isn’t always an instant option that people can take advantage of, but the good news is there are a lot of things that you can do to help improve your financial situation and ease you into a downsized way of living. A common theme amongst people who are determined to live a life of financial freedom is to not sell your home but instead list it on places like AirBNB. You can get paid to rent a room or even your entire house. Doing this can help pay off debt and in some cases even cover the cost of your mortgage! Check the AirBNB calculator to see how much you could be making. This is a metho you’ll love if you are hoping to downsize your home someday but just aren’t sure how much space you’ll need or how to get started. This works perfectly if you have unused space in your home or when you have kids that are moving out. Instead of filling these spaces or repurposing them, make the time to completely clear them out. Slowly go through the process of clearing one room at a time until you have eliminated a significant amount of space. This will help you have less to clear away when the time comes to downsize and it will give you a good idea of how much space you’ll need! If you know you are living above the recommended 30% of living expenses but just can’t manage to sell your house right now, you might considering looking to refinancing. While this isn’t something I would normally recommend, it often is the best choice to ensure your financial survival. Depending on how long you have been living in your home, how often you make payments and your current interest rate, you may be able to refinance and significantly lower your monthly expenses. Use whatever money you save to start a smart budget, get out of debt, and build a savings. Get the Fun Sized Budget Bundle. Whether you want to pay off debt, start a downsize now or plan for a downsize down the road, it is important that you get a solid plan in place. The best advice when it comes to goal setting is to start from the end result and work your way back. Get small, tangible steps in place that you can start doing today that will help ensure you reach your downsizing goals down the road. Downsizing has a lot of pros — saving money and gives you more time to do more meaningful stuff. I find that when you have too much, it can consume your life. For example, it’s hard to clean a big place unless you have lots of moola to hire cleaning services every few weeks or so. Also, lots of space means more room for storage and stuff that most tend forget to use lol! I usually like my place not too big and not too small. I want to have enough room to feel comfortable but not tooo tiny where I’d feel it’s too tight! Exactly!! We love our smaller place and I definitely love cleaning less!